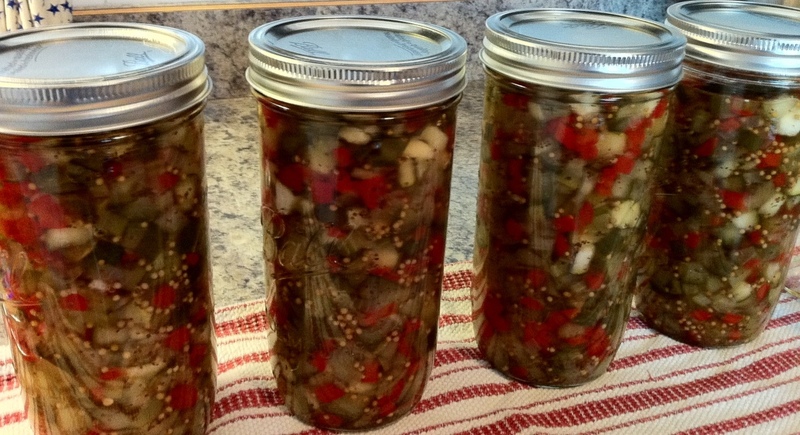 Meditations on Relish, the Food, and the Lifestyle! 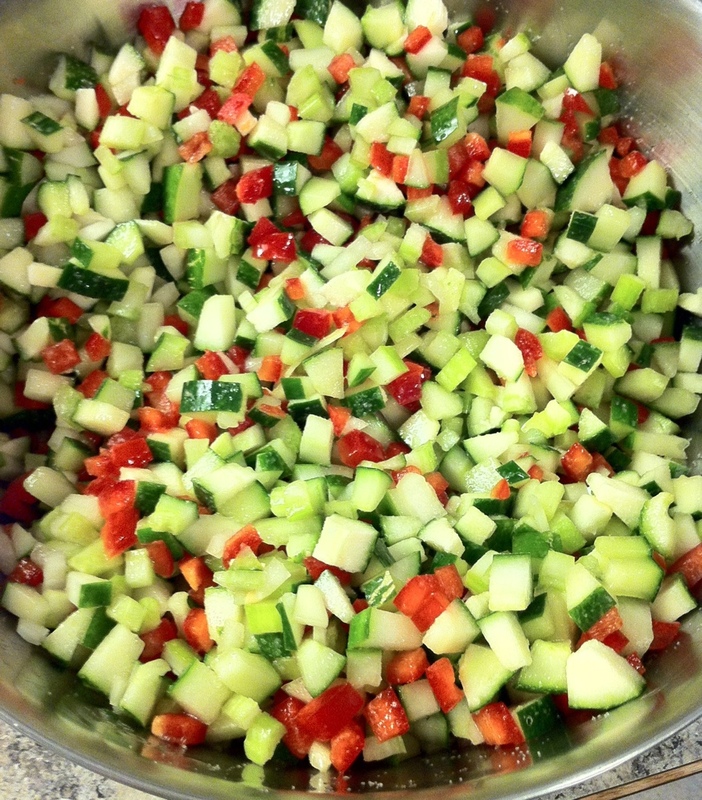 This is 16 cups of hand diced vegetables. I tried the food processor, but it started turning things to mush. Rookie mistake, and I think I like the hand chopping! My mind is a complete blank and that is a good thing. Normally, I am filled to the brim with lists of things to do, goals to accomplish, needs to be met, laundry to be folded, or animals to be fed and watered. This morning feels peaceful, still, and dark. I know that later on today, we will be canning the last few batches of tomato sauce, spaghetti sauce, tomato soup and some whole tomatoes. That is a lot of chopping, dicing, stewing, and boiling of giant vats of water for the canning process. Here is the stewing process – after it sat for several hours in canning salt, then drained, then it was added to the spices to simmer before going in the jars. There is a bit of Zen to the art of chopping vegetables that will go into a jar, and become part of a group of other jars lining shelves that will feed our family all through the winter. It’s getting back to something from long ago, a pioneer spirit, a do-it-yourself food plan. We planted it, watered it, weeded it, tended it, picked it, cleaned it, chopped it, seasoned it, stewed it, stirred it, and put it in a can for later. We did it as a family, and we did it all for the first time this year. Throughout the year there have been times when I felt overwhelmed, but more often, I felt empowered. I got to be one with the earth, and there is something mystical, holy and pure about that. I have begun a process of becoming in tune with nature, and there is joy and wisdom there that I need, that I long for and reach out for, and am finding it reaches out for me as well. 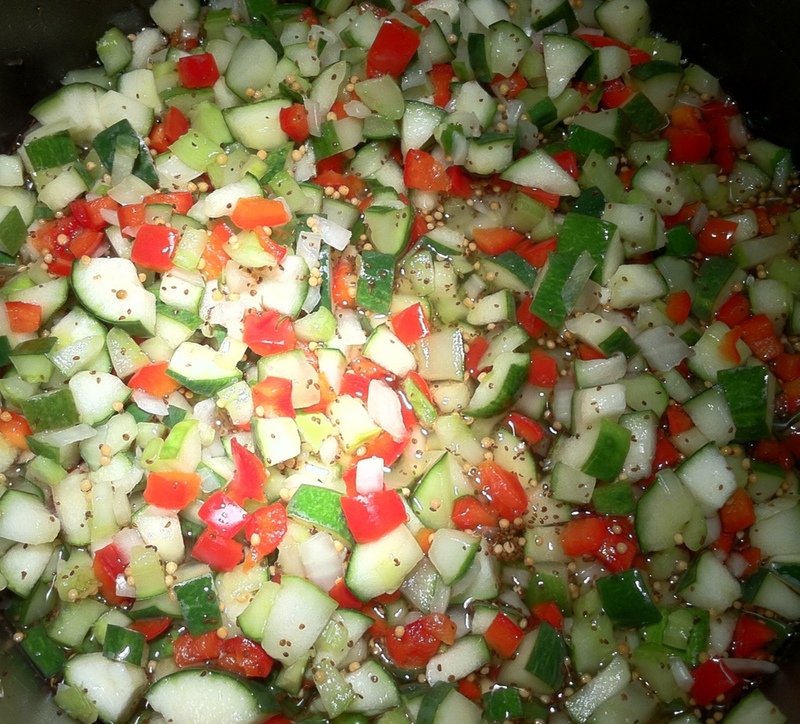 The finished product – Relish! Completed before work on Thursday. some more good thoughts, but on another plane – – how do you get the pieces chopped so evenly !? Thank you – and to be honest, I do not know. I just sliced, and diced, and chopped for an evening. Ha. I agree that your chopping skills are really great – they look so even and precise! Love that you canned as a family! What great bonding and, hopefully, a new season tradition! Wow. I thought it looked pretty – that’s why I snapped a picture. It’s so nice to hear from others that it looks good. We are still very much beginners. I may yet learn to cook! Thank you for stopping by, and what a nice comment! This is our first year doing this. We are such rookies. But it is tremendously fun and rewarding.